Asteroid Apophis (Greek for the Egyptian god, meaning destroyer), number 99942, first identified in 2004 and designated 2004 MN4, was recently predicted to pass by Earth in April 2013 and 2021, extremely close to Earth in April 2029, (within approximately 15,000 miles), and possibly impact Earth in April 2035 or 2036. A 400-meter Near-Earth Asteroid (NEA), Apophis 99942, is predicted to pass near the Earth on Friday April 13, 2029, it will be about 22,600 miles (36,350 kilometers) from Earth's center. That is just below the altitude of geosynchronous satellites, which hover in fixed perches above the planet to communicate with and collect data on half the globe at all times. A satellite in geosynchronous orbit circles the earth once each day. The time it takes for a satellite to orbit the earth is called its period. For a satellite's orbit period to be one sidereal day, it must be approximately 35,786 kilometers (19,323 nautical miles or 22,241 statute miles) above the earth's surface. That is a lot higher than the Shuttle ever goes (usually about 300 kilometers). Apophis was discovered on June 19, 2004, by Roy A. Tucker, David J. Tholen, and Fabrizio Bernardi of the NASA-funded University of Hawaii Asteroid Survey from Kitt Peak National Observatory in Arizona. The odds of impact, presently around 1 in 300, are unusual enough to merit special monitoring by astronomers, but should not be of public concern. These odds are likely to change on a day-to-day basis as new data are received. In all likelihood, the possibility of impact will eventually be eliminated as the asteroid continues to be tracked by astronomers around the world. Ground-only tracking has a 99.8 percent chance of eliminating any chance at all of an impact. When first discovered, the object received the provisional designation 2004 MN4 (sometimes written 2004 MN4). It received the name "Apophis" as of July 19, 2005. 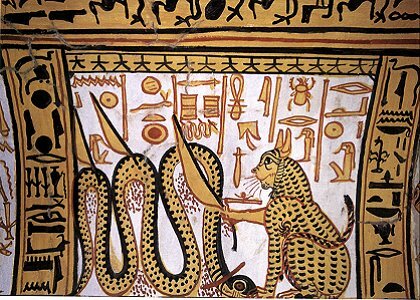 Apophis is the Greek name of the Ancient Egyptian god Apep, "the Destroyer", who dwells in the eternal darkness of the Duat (underworld) and tries to destroy the Sun during its nightly passage. Although the Greek name for the Egyptian god may be appropriate, Tholen and Tucker (two of the co-discovers of the asteroid) are reportedly fans of the TV series Stargate SG-1. 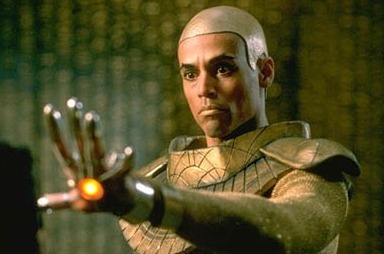 The show's main antagonist in the first several seasons was an alien, a Goa'uld, named Apophis who sought to enslave and destroy Earth. The orbit of Apophis 99942 (2004 MN4) about the Sun is shown in blue. 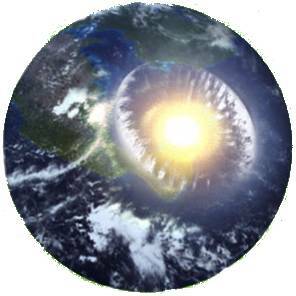 Much of the asteroid's orbit lies within the Earth's orbit, which is the outermost white circle. The positions of the asteroid and the Earth are shown for December 23, 2004, when the object was about 14 million km (9 million miles) away from the Earth. Animation showing the cloud of possible positions of asteroid Apophis 99942 (2004 MN4) relative to Earth in April 2029 is shown in white. The Moon's orbit is also shown, for scale. A tiny portion of the cloud intersects the Earth. The length of the cloud is directly related to current uncertainties in our knowledge of this object's orbit. The asteroid is about 320 meters wide(1000 feet). That's big enough to punch through Earth's atmosphere, devastating a region the size of, say, Texas, if it hit land, or causing widespread tsunamis if it hit ocean. NASA initially estimated the energy that Apophis would have released if it struck Earth as the equivalent of 1480 megatons of TNT. A more refined later NASA estimate was 400 megatons. The impacts which created the Barringer Crater or caused the Tunguska event are estimated to be in the 10-20 megaton range. The 1883 eruption of Krakatoa was the equivalent of roughly 200 megatons. 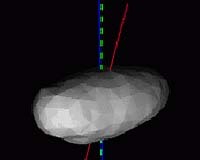 The exact effects of any impact would have varied based on the asteroid's composition, and the location and angle of impact. Any impact would be extremely detrimental to an area of thousands of square kilometres, but would have been unlikely to have long-lasting global effects, such as the initiation of an impact winter. Apophis is the only asteroid that ranks on the Torino scale - a Richter-style rating system adopted by NASA in 1999 to rank asteroids in terms of their size, chance of colliding with Earth, and level of damage they could do if an impact occurs. Apophis is classified as a level-one threat, for which "the chance of collision is extremely unlikely with no cause for public attention or public concern." NASA continues to refine its understanding of Apophis' course. Though the risk of a collision is small, NASA is considering plans for thwarting Apophis should future observations show it to be a threat. The potential for a Apophis smacking into the Earth in 2036 cannot be discounted.